Road Rage in Canberra – Just CALM DOWN!! I’ve done a lot of stupid things in cars and on motorbikes in my life. I’ve driven drunk on numerous occasions; I’ve pushed a car past 200 KMs per hour; and once, I attempted to jump over a small dam on my little XR 75… I didn’t… quite… make it. However, I’ve never had an accident on a public road, and my days of reckless driving are but a distant memory in the rear vision mirror of time. In fact, many of my friends accuse me of driving like a grandpa – a critique I take with pride. Like you, there are a lot of people out there on Canberra’s roads who really make me angry. Nothing puts the sand in my crack more than people who drive at high speed in school zones, or those people who somehow think that the more they tailgate you, the faster they will arrive at their destination. Sometimes it almost seems that the foggier or rainier the weather, the faster some Canberran drivers want to drive. 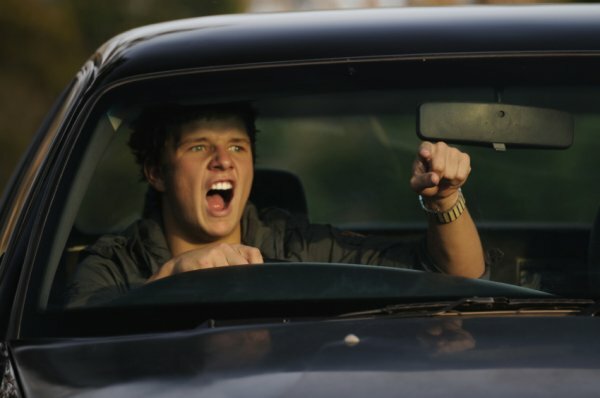 Canberra’s roads are often war zones – a furious flurry of erected fingers and muted expletives – and I can understand people’s frustrations, but what I will never understand is road rage. Recently this year there have been a growing number of serious incidents of road rage on Canberra’s roads. The most recent and public example of Canberra’s road rage problem would be Daniel Forsyth, 29, who was sentenced to 10 months gaol by ACT’s Chief Magistrate for furious driving, assault, and possession of a dangerous weapon. Unfortunately, this incident was also underscored by a disconcerting racist element. Police have also alleged that last Saturday morning a young man smashed a car’s window with a shifter before fleeing on the Barton Highway at about 11am. The answer to Canberra’s road rage certainly isn’t more punitive and authoritarian measures in the form of legislation. Although, in order to improve the ACT’s quality of driving, I am in favour of more thorough driving tests rather than slugging families by forcing them to pay exorbitant fees for driving lessons. Other than already living in the most regulated jurisdiction in Australia, more laws just waste the time of police, clog up the courts, and annoy the public… possibly contributing to more rage. What Canberrans and their families expect and deserve is a greater police presence on Canberra’s roads. We don’t want more parking inspectors; we don’t want more roadside vehicle inspections; and we don’t want more drugs testing to see if someone has had a toke of a joint a few days ago. We want our fellow police officers to protect us from the small minded bast#rds who put our lives, and the lives of our children, in danger every day. A good driver is a safe driver. I couldn’t agree more. I have clocked up serious hours driving in the US and parts of Europe and I think Australian drivers in general but especially in Canberra are the worst I have experienced in terms of their impatience and lack of consideration for other road users. I’ve been driving along at the speed limit on some occasions and cars tailgating me in the rain and flashing lights (this wasn’t a dual carriageway so moving to the left wasn’t an option. Unless they’re a trauma surgeon on the way to some emergency there’s no excuse. Recently I saw on Adelaide Avenue an accident involving two such wonderful drivers who had ploughed into each other plus the poor unfortunate up front. It didn’t surpass the record I saw of five cars that had smashed front to back into each other outside the Lodge several years ago. I only see road rage brewing when people use the right hand lane and drive 10-20km/h below the limit, thus slowing ALL the traffic behind them. The tail-gating, beeping, headlight flashing and constant lane swapping by the frustrated person/s behind will eventually result in road rage to various degrees. It all comes down to courtesy, if you aren’t going to turn right at the next intersection, don’t use the right hand lane. It’s called the right lane because it’s the right lane to use! Don’t try and excuse road rage or dangerous driving. If i’m not overtaking I’ll pull to the left lane, it’s just common sense and avoids hassle, enhances traffic flow. Defensive safe driving. I just use the UK method and only go in the right lane if I overtake…it’s sort of instinctive, different to the way Australians use dual lanes but the laws of traffic flow are the same everywhere, you adjust to the situation to let everybody make best progress. They have laws, and they have a driving code. The two can be mutually exclusive…..somebody might not be doing anything “illegal”, but they could still be impacting on the ability of another driver to make progress (ie…pulling out and making them brake sharply or swerve…dawdling in the overtaking lane blocking a line of traffic etc). You have a duty not to impede the progress of other drivers, even if they’re breaking the law….if they want to act like idiots, it’s not your job to stop them. They had a lot of this stubbornness from drivers who refused to move over and it was causing road rage and these people were getting attacked, or there were more accidents as people tried to swerve round them. In the end they had to make a stand because road rage incidents kept on increasing whatever they did. Ultimately, police can now issue fines to lane hoggers or obstinate drivers who are NOT doing anything illegal, but the thinking is that they should know better than to inflame a situation that they’re obviously aware of and are thus not following the driving code themselves by impeding other drivers’ progress. Whatever the moral rights and wrongs of this, move over to protect yourself and reduce the chance of an accident. Let the police catch the lunatics. The UK system isn’t perfect either and going to the right to overtake and then straight back let only seems to be the norm on 3+ lane motorways. On 2 lane motorways and Ax(M) roads they are just as bad if not worse than here in Australia despite the law saying to move left. Drivers are also a lot less tolerant of vehicles who don’t move and IMO if you are overtaking and a car is behind if you don’t go straight back in and I mean straight back (dangerously so rather than leaving a safe gap) they will flash and tail gate you until you do the. As you are moving over they are up your inside. The other bad thing is you cannot overtake on the left even on a multilane road. So if the right hand lane is being joyed you cannot use the left lane even if free to pass, unless both lanes are congested. I say this based on 4 years living there and a recent holiday where I drove extensively for 3 week. On the last trip I found the worst road was the M8 between Edinburgh and Glasgow, 2 lane motorway and even at 2pm many cars just sitting in the right hand lane with left free. What they do very well however is not use fog lights in clear weather. Actually that’s not entirely correct. In the UK, if you are in a two or more lane road and someone is in one of the outer lanes and is not overtaking another vehicle it is acceptable to pass them on the inside provided you do not break the speed limit. This from a UK traffic policeman mate of mine. Does anyone know whether this is also permitted in the ACT? I have driven all sorts of vehicles in all sorts of jurisdictions including London, with its heavy, heavy congestion (you don’t know what rush hour traffic is until you’ve driven in London); Paris, including the Arc de Triomphe where legend has it insurance companies will not cover you for an accident that occurs on this multi lane non-road marked wheel of insanity; Nice on the Cote D’Azur with its two-way five lane bonkers sea front where you compete for lane space with teenagers doing wheelies on motorbikes; and SIngapore where government promoted kiasu makes driving a whole new experience of craziness. I regret to say though that consistently the worst driving I have ever seen in terms of dangerous driving, rage and lack of courtesy is right here in Canberra. I’ve read all sorts of articles and discussed it with friends and colleagues. Suggestions of reasons range from Canberrans being spoilt with the wide open roads, space and lack of traffic, to lack of police presence. It has also been suggested though that perhaps some people are just a***holes. More police presence and much stiffer penalties for those who break the road rules is surely the only way to persuade people who think it is ok that is it in fact not ok to drive like an idiot. Ps should have also added I don’t think they are any worse either. It’s far from perfect, there are way too many cars for the road infrastructure, it’s congested, cars are parked everywhere blocking sightlines, constant braking and accelerating, maneuvering through constant tight situations, drivers are more impatient and they drive very fast, road rage is a daily occurrence, tyres squeal when traffic lights change to green, it’s a stressful race track and horrible compared to the easy driving in Canberra. However, and this is what blows away the ACT Police’s insistence on only targeting speeding…….with a much faster driving environment and higher speed limits and all the associated problems mentioned above….fewer people per head of capita die in UK traffic accidents than in Australia, and there is a lot more risk there with more cars sharing the road, more turns, more stopping and starting, more people impacting on your driving. I can’t explain why, other than it’s a safer driving environment because driving tests are hard to pass and drivers are well-schooled, well-skilled, observant and practiced. The driving environment in Canberra is a dream, but the level of understanding and awareness just isn’t there. If it was, the slower speeds would result in less deaths, but they don’t. So it must be something else. But do tell me, why do you feel that you don’t have to use your indicators? Why bother, this is one of the many optional laws, it’s not something that the police will fine you for. I choose to indicate as I think it is better for transport safety. Especially in dense and busy suburbs where there a lot of commuter and work activity. What is everyone’s interpretation of merging into say the parkway or Adelaide ave.
Because i have spoken to a few people who are divided on who has to give way. Merging would never be an issue if drivers applied the two/three second rule at all times. Of course that is impossible given the huge number of stupid on the roads! Others tend to believe the opposite that the car in the left lane closest to the oncoming ramp has to move over and let them in. I think this is why we have a few crashes near the on coming ramps. The road rules clearly stipulate that the person in the terminating lane must give way to any traffic in the lane they’re trying to merge with – even if it means coming to a complete stop do so safely. People often confuse this with the common Form One Lane merge where the vehicle in front has right of way regardless of lane – hence it often being described as a zipper merge. I don’t see where people are driving fast. I’m constantly stuck behind people doing 10 k’s under the limit. Kuringa drive is 80k’s between the Barton and Owen dixon drive if you didn’t know. And where its 100k’s on the Barton, get out of the right hand lane if again you aren’t confident doing the speed limit. Biggest problem I find is however than absolutely no one uses indicators. And this is everywhere. Even on Northbourne Ave. There’s no excuse for this. But do tell me, why do you feel that you don’t have to use your indicators? It depends on the line markings on the road. Dotted line showing left lane terminating: merger gives way. If it is Form One Lane with no line indicating a terminating lane, then the car that is furthest ahead has right of way. Has anyone else noticed that the ACT Learner Drivers Handbook is not available online this morning? The problem with Canberra roads is not driver education or lane merging. The problem is 100% bad driver behaviour and attitude. Most times it is drivers under 30 years old who think they are a reincarnation of Peter Brock – and it is not just young men either. Young women are every bit as bad as young males at the moment. There are two examples of exceptionally poor ramp design on the parkway. First is at the Cotter Overpass onto the parkway, northbound and one of the primary sources of backed up traffic on weekday mornings (yet another serious accident there last week) and is set to get worse now that we have new suburbs springing up. Second is the southbound merge onto the parkway from Lady Denman Dr onto the parkway immediately adjacent to the entrance to the Arboretum. The only real surprise is that more people have not been seriously inured or killed at these places. Regarding fog lights, the main reason cops don’t book for these, is because they are not fog lights. Most are driving lights with a lower brightness than main headlights. So the law is fog lights, but manufacturers call them driving lights and make sure they are no brighter than headlights. They are also often very low and tilted towards the road surface. A cop will never book someone for that offence if commonsense is its not causing a hazard to other drivers. drive with your high beams on in with other traffic around and you’ll get booked. I am going to correct you here, they are fog lights, not driving lights. Driving lights are only to be used when the high beam is on. The way they operate is in accordance with the requirements of ADR13/00. Most manufacturers do not call them driving lights, they call them fog lamps. BA Falcon Ute Owners Manual, page 70, “fog lamps”. Many Canberra highway ramps were not designed properly. It was not a good idea to have off ramps immediately after on ramps. You drive off the highway at the same time other people are merging onto it. Poor road design. Even worse example of design, the Parkes Way off ramp heading south from Coranderrk street, where you have traffic entering Parkes Way, attempting to merge into the right lane with traffic doing 80km/h and then merging to the left lane in order to exit onto Commonwealth Avenue. All this happens in less than 300 meters, giving the maneuver only around 10 seconds to complete. No wonder there are always cars slamming on the brakes as they pass the duck pond, with folks cutting across in front to make the exit ramp in time, or slowing down to get behind a car in the left lane. Our resident bleaters about how they’re “not doing anything illegal hogging the right lane” should read this again. The merger must give way, however it is just considerate and simple common sense to move into the right hand lane to let them in. Another win for driving only in the right hand lane!!!! Really? I’ve found the inner burbs to be okay and the outer burbs (eg. Gungahlin IME) to be the place where impatience on the roads increases. Not a lot, but enough to be noticeable. I do notice that too. The motorists should drive to the conditions of the road in busy suburbs, rather than driving at the constant speed limit of 80km/h when the traffic conditions do not make it safe to do so at peak traffic times. There has been a lot of construction and growth in the Gungahlin area. The Horse Park Drive extension has also been opened recently. Many of the roads, such as the Gundaroo Road need duplicating nowadays, because the roads were constructed before many new suburbs were constructed. Anything that is illuminated by fog lights is simply *too close* for you to react in time. So you may feel like you’re seeing more, and you are, but it’s actually making you a more dangerous driver. I don’t use mine all the time, but do use them especially later at night for extra visibility. This aspect of the use of fog lights in clear weather – apart from it being illegal – is extremely dangerous. Why? Because fog lights only illuminate what is directly in front of the car, and draws the driver’s attention to that closer area to the detriment of observing far ahead. Keeping your focus as far ahead as possible is a key aspect of defensive driving – it allows you to identify potential hazards and prepare to respond should they eventuate. It means you’re ready to react should that kangaroo jump towards the road, or that car decides to pull out, or there’s an unexpected obstacle on the road once you round that blind corner.